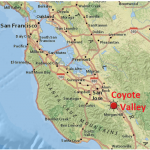 In the late afternoon of August 19, 2014, the Discover Coyote Valley Initiative along with the University of California Cooperative Extension and Amega Farm Company trained culinary students of the International Culinary Center (ICC) of Campbell about local sourcing for food. 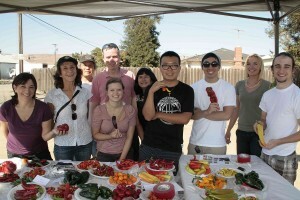 Over 68 varieties of chili peppers were displayed on the table to share, touch, smell, and taste. Rachel Lintott, Assistant Director of the ICC acknowledged “We bring our farm to table students out to nearby farms so they can learn the importance of where their food comes from, who grows it and the real effects of their choices in the kitchen. 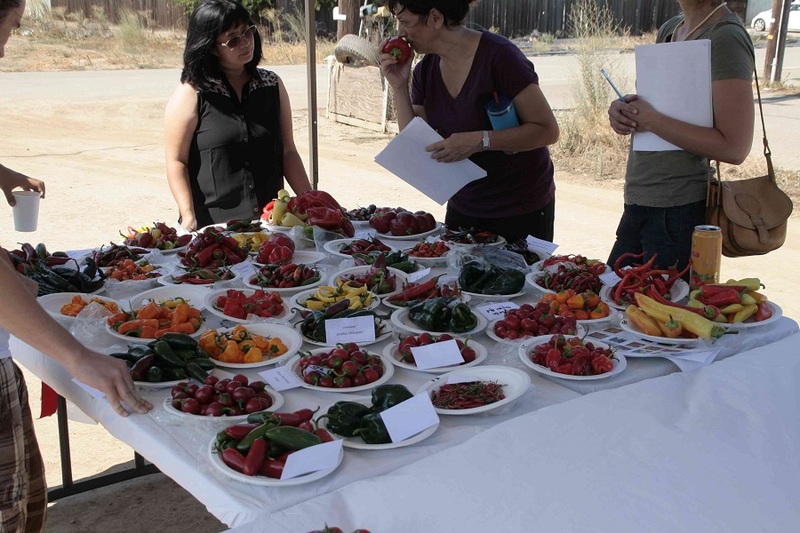 “ Students learned about the Scoville heat index, the different chili pepper categories and how their dishes can be imaginative using specialty crops that are locally grown. Students were asked to take the 68 varieties of chili peppers – to experiment with them, prepare them in different ways and offer food samples at the upcoming September 27, 2014 Coyote valley Family Harvest Fest hosted by the Open Space Authority. The culinary students then had a chance to visit with John Spina from Spina Farms located at 8820 Santa Teresa Blvd, San Jose, CA. 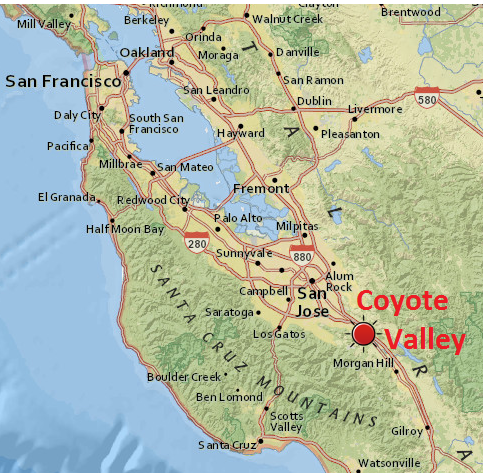 Spina Farms is a family owned and operated business with strong roots in Santa Clara County for over three. Open from Mid April to early November, the Spina family features locally grown produce, including dried apricots, Brentwood nectarines, sweet corn, new crop apples, vine-ripened tomatoes, sweet onions, strawberries, cherries, stone fruit, corn, tomatoes, watermelon, cantaloupe, and a wide variety of pumpkins and squash. They offer homemadebreads including banana, pumpkin, cinnamon, zucchini and sometimes, apple and banana rum. With that bread, they also offer a wide variety of jams – strawberry, raspberry, triple berry, mango, nectarine – all made with local fruit. Spina Farms was established in 1944 by John Spina. 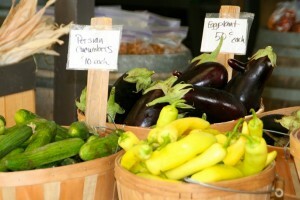 He began by raising tree and row crops which included apricots, prunes, and canning tomatoes. As the family’s next generation rose up, son and daughter-in-law, John and Linda Spina took the farm down a new path, the direct market. 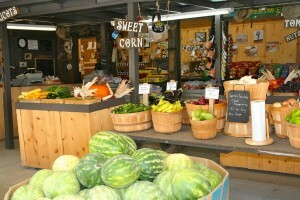 The fresh fruits and vegetables of the fields were available directly to the consumer in what became Spina Farms’ first Produce Stand. In 1970, Spina Farms brought forth a Pumpkin Patch. 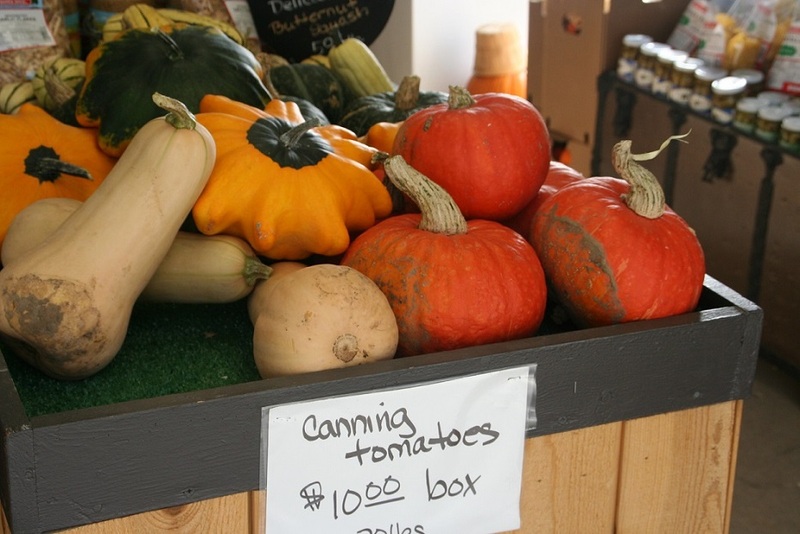 This small, family-run patch began with a couple different varieties of pumpkins and homemade decorations. With yet another generation to follow, Johnny Spina, who grew up making family memories in his parents’ Pumpkin Patch, has taken growing pumpkins to a new level. With the same desire to maintain a family atmosphere for those who visit, Johnny and his wife, Shauna, carry on the tradition of homemade decorations and now over 60 varieties of pumpkins. They do not charge admission for parking or for admission to the pumpkin patch. Spina Farms continues to cater to families with a tours for children to ride the train, learn about how pumpkins grow and bring a pumpkin home. For birthday parties, they used to have one tent and now they have four which can be reserved ahead of time. When schools can’t afford to bring their children to the farm, Spina brings the pumpkins to the school. The culinary students asked many questions about how farming has changed over the last 30 years. Farmers are now having a tough time just making ends meet and facing tough challenges such as the drought, competitive pricing and stricter U.S. regulations. John Spina mentioned that when the canneries move out of town, it really changed the way he did business. Currently, John Spina is working with other partners on seed trials to see how they can produce the best outputs for their crops. For instance, there is much to be gained by growing corn with tight husks, as to avoid birds destroying 30-40% of their corn output in previous years. Culinary students were challenged to think about where their food comes from, how they prepare it and how it will ultimately affect the food they serve in the future.